Chocolate covered cactus pretzels are a fun and creative Cinco de Mayo treat idea! Cinco de Mayo will be here soon and it's time to start thinking about your menu. While you may have lots of yummy Mexican foods planned for dinner, what about dessert? 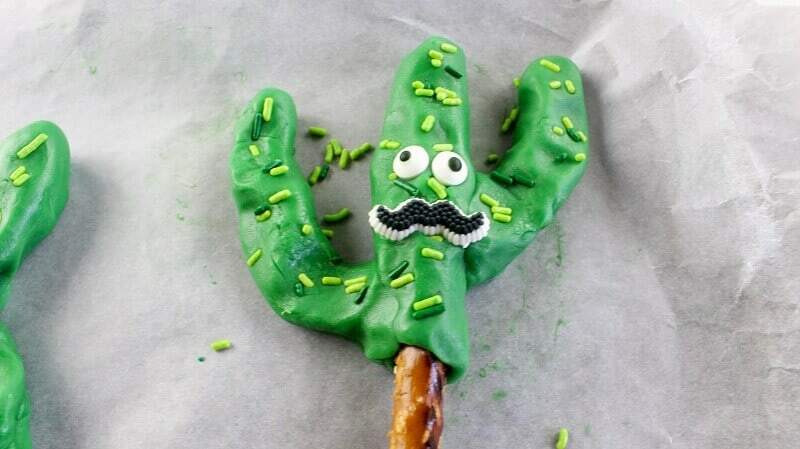 Not only are these cactus pretzels a tasty treat, but they will also add a beautiful touch to your Cinco de Mayo table. 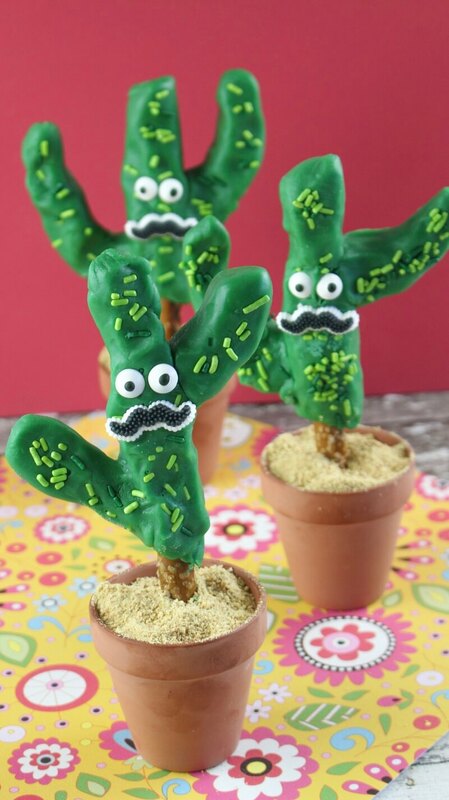 Of course, these cute cactus-shaped snacks aren't just for Cinco de Mayo. Cacti are super trendy this year. These would be awesome for any get together with the girls. You could make these and decorate your table with them for a girls' night in. You could also decorate any summer get together with these. Just leave off the mustaches and eyes. Don't let the instructions limit you either. If you're going to make these for another day other than Cinco de Mayo, try making different shapes. You could make short fat cacti or tall club shaped ones. Just have fun with it. 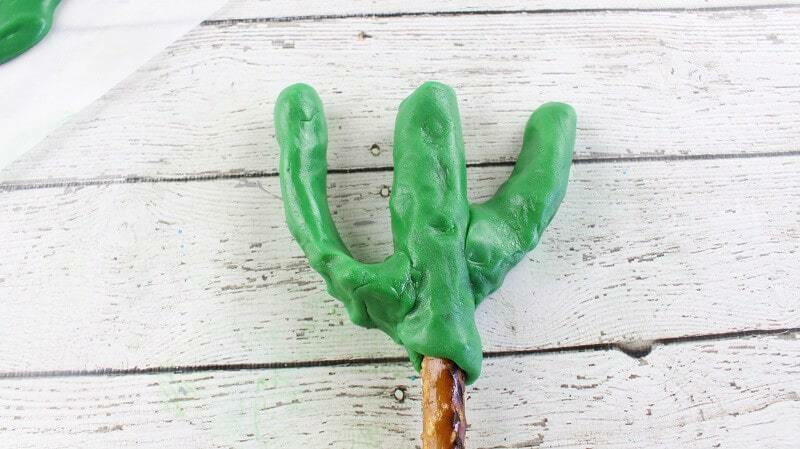 Best of all, you can find almost everything you need to decorate these cactus pretzels on Amazon. No running all over town to every craft store to find what you need. If you want something fun to do with the kids this Cinco de Mayo, this is an awesome craft/recipe combo. Your kids will have so much fun. 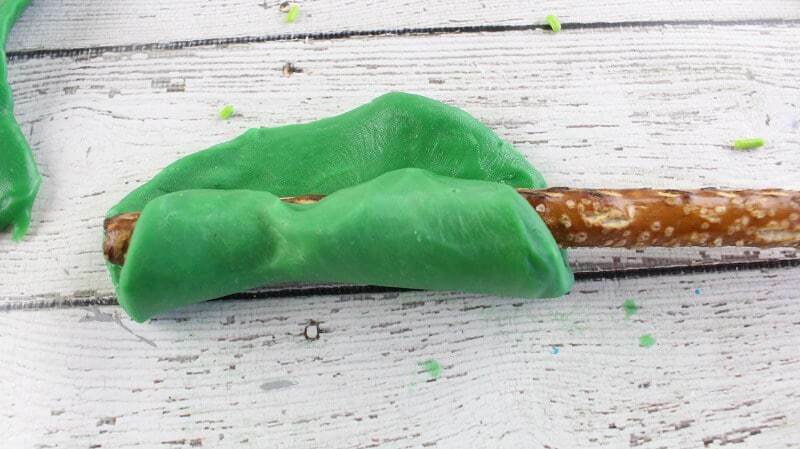 Let each child make their own cactus pretzels and write their name on the little pot they are displayed in. First, line a cookie sheet with wax or parchment paper and set aside. In a microwave safe bowl, add the corn syrup and green candy melts. Microwave and stir in 30 second increments until the mixture becomes thick and slightly pliable (this took me about 4 increments). 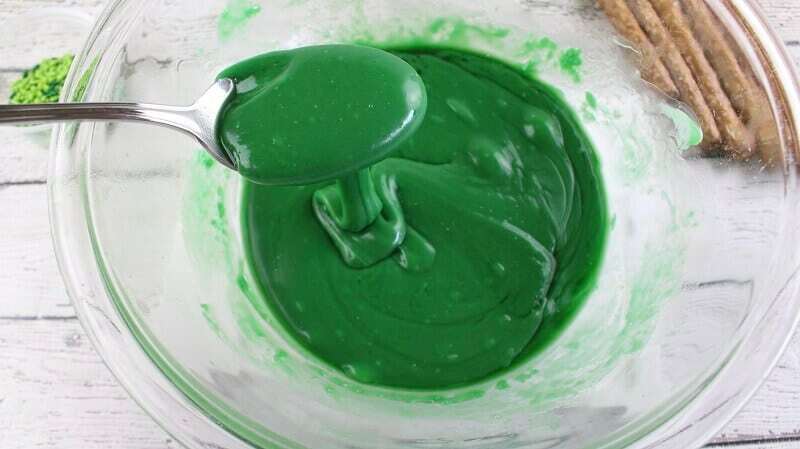 Pour the melted green candy melts onto the lined cookie sheet and spread out evenly. Allow to cool for 5 minutes. The texture will turn into a taffy-like consistency. 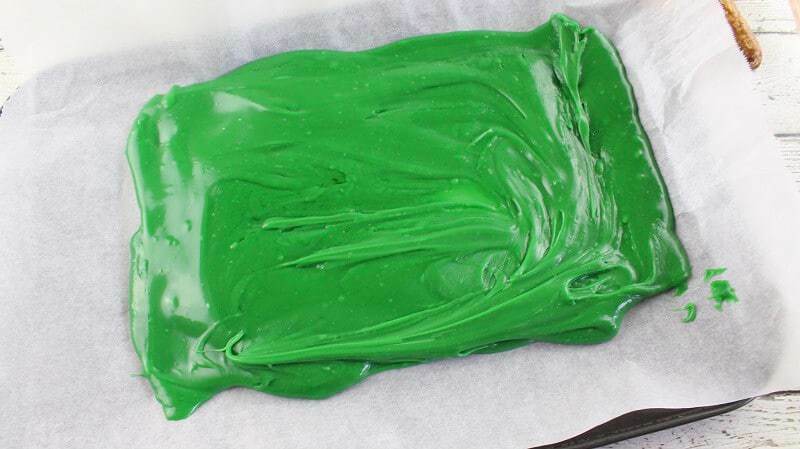 Divide up your green chocolate “taffy” into 6 separate pieces. Each piece will be used to make one cactus pretzel. Set aside the lined cookie sheet for later use. Divide your taffy piece in half. Flatten and roll out one of the half pieces and place the upper part of a pretzel rod on top of it. Roll the melted chocolate around the pretzel and over the top. Pinch and seal any openings and roll the pretzel back and forth to even the chocolate out. Divide the remaining “taffy” piece in half. Roll each piece into the shape of a cactus arm and press firmly into the shaped pretzel rod. Place back on the lined cookie sheet. 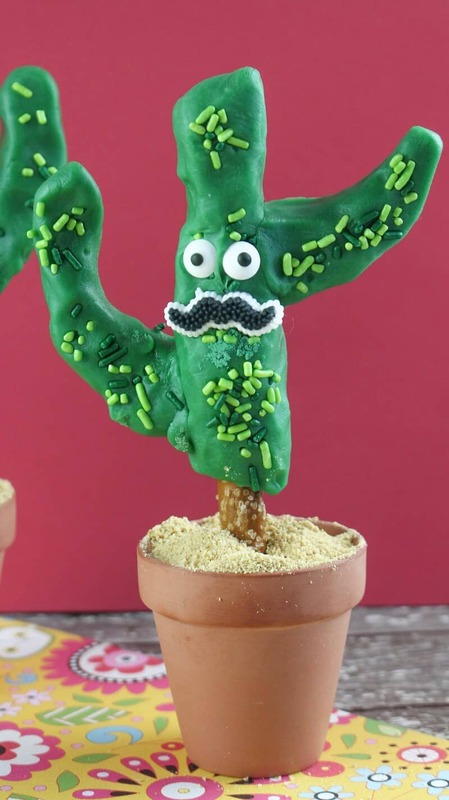 Before the chocolate completely hardens on each cactus pretzel, sprinkle with the dark and light green sprinkles to represent the cactus spines. 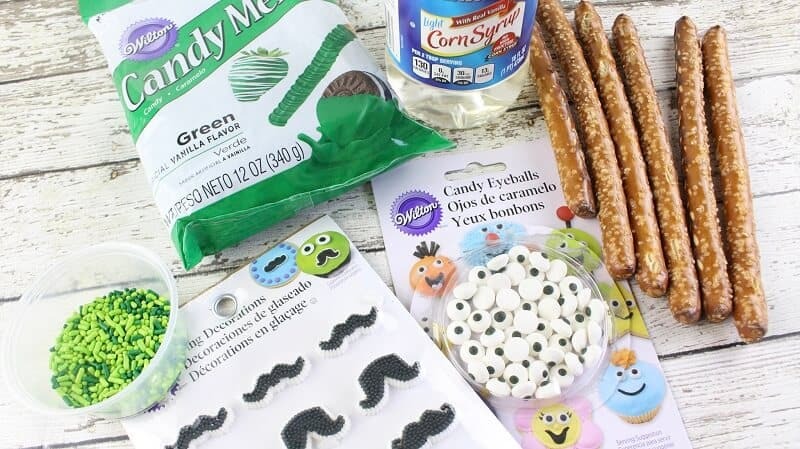 Press 2 candy eyes into the middle of the pretzel and a candy mustache directly underneath the eyes. Allow the chocolate to completely harden (20-30 minutes). Fill mini clay flower pots ( I found these at Dollar Tree 3/$1) with leftover green “taffy” at the bottom. If the chocolate has already hardened, microwave for 10 seconds to soften it back up. Insert each pretzel rod into the chocolate taffy and fill the flower pot with graham cracker crumbs to look like sand. 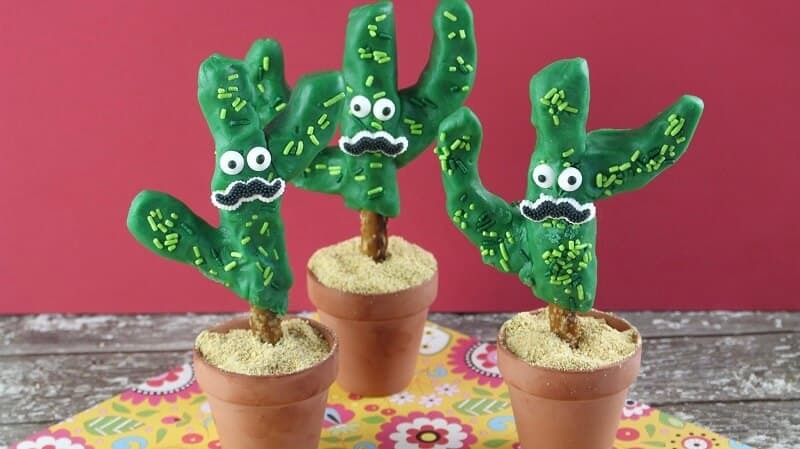 NOTE: If you don't need your centerpieces to be edible, you can also fill each flower pot with Playdoh to keep the cactus upright and then cover with graham cracker crumbs. That's it! I hope that you enjoy these adorable Cactus Pretzels! 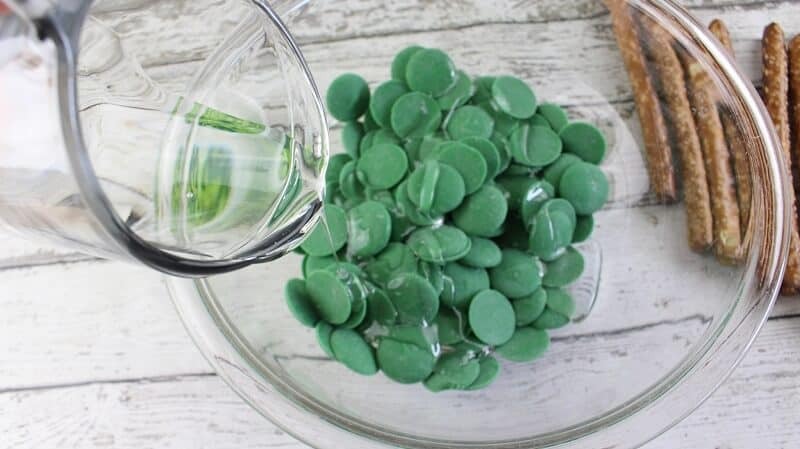 In a microwave safe bowl, add the corn syrup and green candy melts. Microwave and stir in 30 second increments until the mixture becomes thick and slightly pliable (this took me about 4 increments). 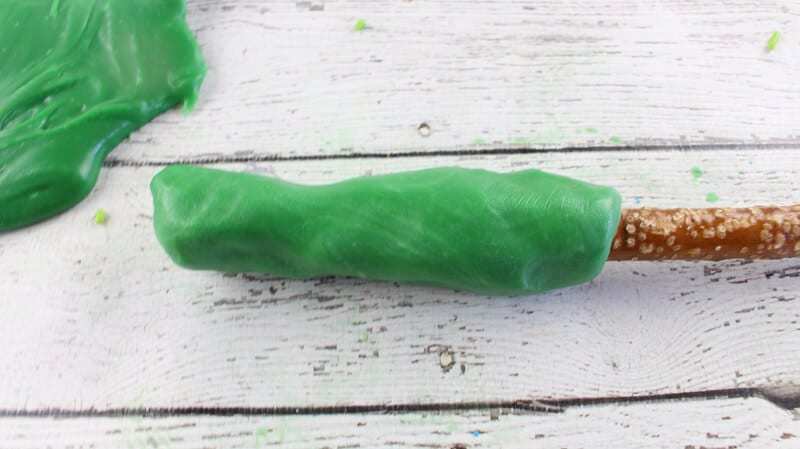 Divide up your green chocolate "taffy" into 6 separate pieces. Each piece will be used to make one cactus pretzel. Set aside the lined cookie sheet for later use. Divide your taffy piece in half. Flatten and roll out one of the half pieces and place the upper part of a pretzel rod on top of it. Roll the melted chocolate around the pretzel and over the top. Pinch and seal any openings and roll the pretzel back and forth to even the chocolate out. Divide the remaining "taffy" piece in half. 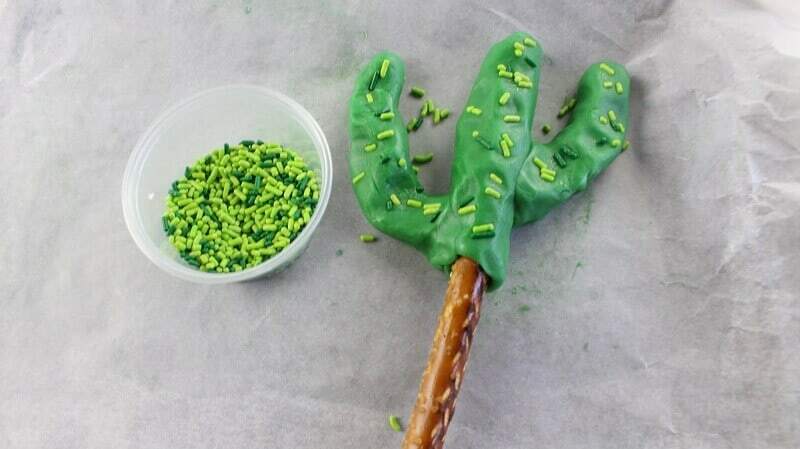 Roll each piece into the shape of a cactus arm and press firmly into the shaped pretzel rod. Place back on the lined cookie sheet. Fill mini clay flowerpots ( I found at Dollar Tree 3/$1) with leftover green "taffy" at the bottom. If the chocolate has already hardened, microwave for 10 seconds to soften it back up. 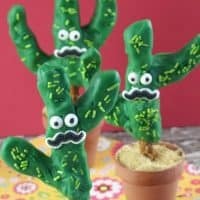 If you don't need your centerpieces to be edible, you can also fill each flower pot with Playdoh to keep the cactus upright and then cover with graham cracker crumbs. That’s so fun! And great pics too. These are so clever! How do people come up with this stuff?! Pinning for future reference. This is the most cutest Holiday Recipe I’ve ever seen, so freaking cute. 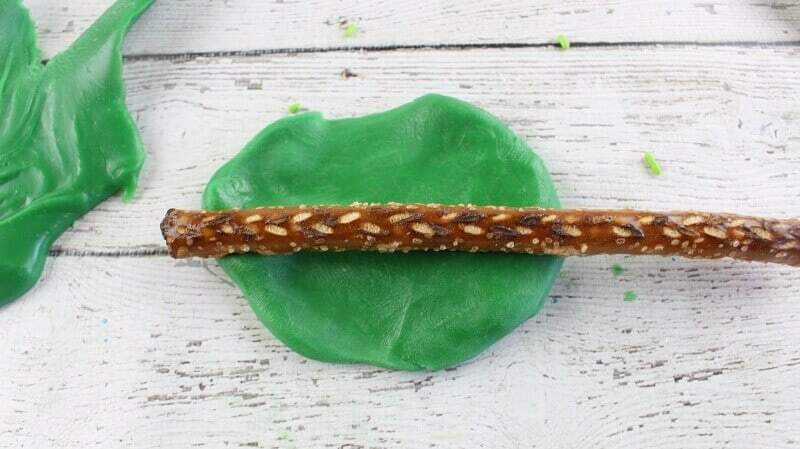 I love that you don’t have to melt the chocolate to avoid the mess on the pretzel rod. It looks fun making them! These are adorable, I’m going tomorrow to get some for our Cinco Party. I can’t wait to see the kids faces. Thanks so much for sharing. Ok, these are the cutest things ever! Very creative! Very clever and cute! Would be nice for any southwest themed occasion. They are so darn cute. Never would have thought of it! This just so cute. My grandkids would love for us to make these. Thank you for sharing. These are just so adorable!!! I love their faces!